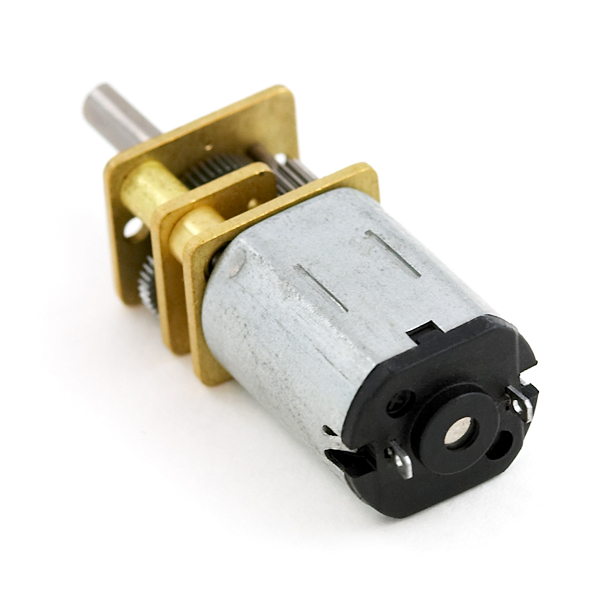 This motor from Pololu has a long (0.365" or 9.27 mm), D-shaped metal output shaft that matches the Pololu wheel 42x19mm and 32x7mm. The brass faceplate has two mounting holes threaded for M1.6 screws (1.6mm diameter, 0.35mm thread pitch), or you can use the mounting bracket or extended mounting bracket, which are specifically designed to securely mount the gearmotor while enclosing the exposed gears. We recommend the extended mounting bracket for wheels with recessed hubs, such as the Pololu wheel 42x19mm. 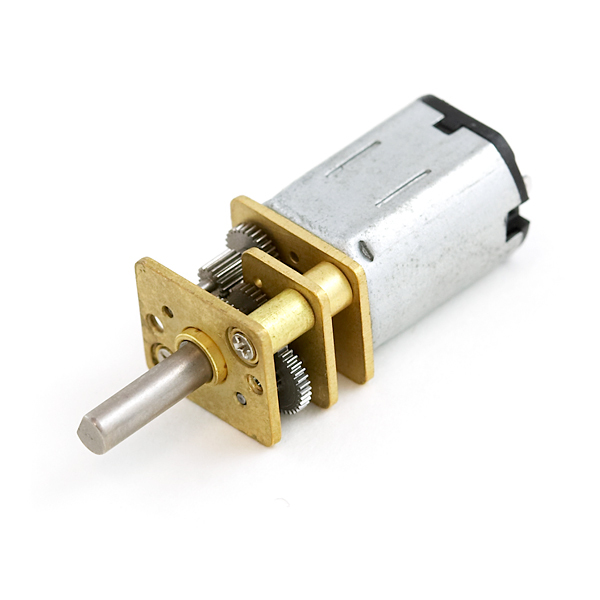 can I build a balancing robot with this motors? can i drive them with 9 volts? For anyone who was interested, the force on this unit (at 6V) comes out to about 0.0282 Nm. how much weight it can handle? I mean in 4wd system how much weight it can push forward? This depends on a lot of other factors. The only way to figure this out is to dust off a physics book and calculate it. i think you are right sir. but what i meant to get some info about practical values. otherwise i can do the calculations. It provides 4 oz/in of torque. That should be enough to get the job done. I apologize if I'm missing something. I think the torque is off a decimal, maybe it should be 26oz.in? If you look at the same motors with higher RPM gearboxes they all have higher torque than this motor...seems to be off an order of magnitude. 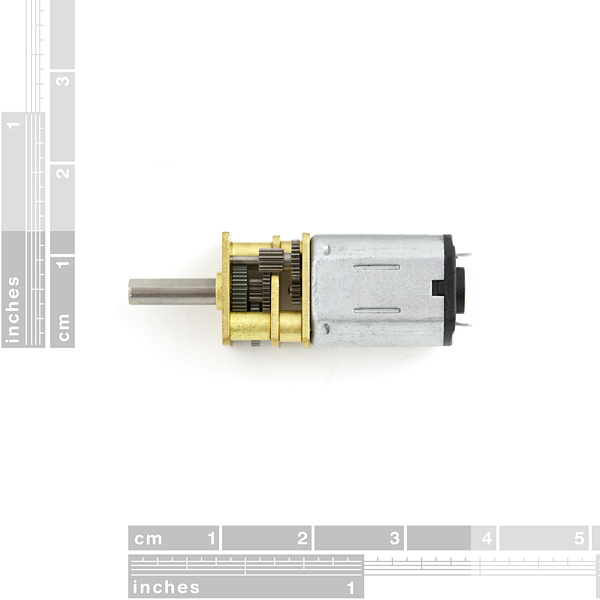 is the 430 rpm for the motor or for the shaft after the gearbox? I have a 6V, 300 ma power supply. What would happen if I used this, compared to a 6 (or 5) V, 1000 ma power supply for this motor? The motor draws as much current as it needs. When it stalls out, it draws its max. It's max current draw is 360mA. 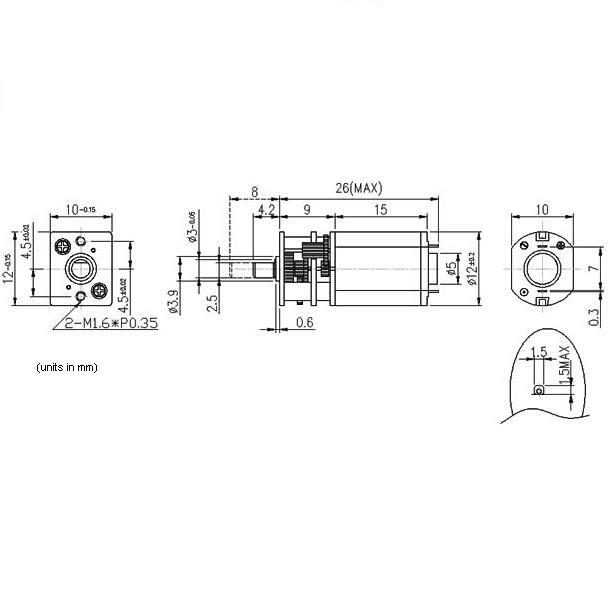 How would I find the speed of these motors? km/h. using the 32x7mm wheels. Which the voltage is being controlled by PWM on the arduino. Sure, with a 32 mm wheel, 32 X Pi = 100 mm. 100 mm X 440 rpm = 44000 mm per minute, or 44 meters per minute, or 2640 meters per second, or 2.640 km/h. sorry, second to last i meant, 2640 meters per hour. How can I control this motor with an Audrino, if I wanted to connect it to a analog pin? You will need to use a motor controller like this or a motor driver like this.